The 12 Steps and the life, passion, death, and resurrection of Jesus lead us to find God and serenity in sobriety. Come away for a weekend with your Higher Power and encounter a new freedom and happiness! In this retreat, we will explore how our own struggles mirror the way of Jesus as well as the way of Bill W. Together we will comprehend the word serenity and know peace! This retreat concludes after lunch on Sunday. Lunch is served at 11:30 am. Fr. 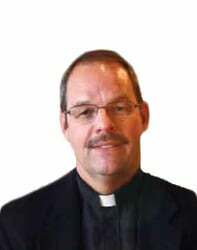 Jeffrey LaBelle, SJ is currently an assistant professor at Marquette University’s College of Education. Prior to his assignment at Marquette, he served as assistant professor of education at the University of San Francisco. Fr. LaBelle holds a BA in InterAmerican Studies with an emphasis in Spanish and ESL from University of the Pacific, Master of Divinity and Master of Theology degrees from the Jesuit School of Theology at Berkeley, and an EdD in International and Multicultural Education from the University of San Francisco. From 1988-2000, Fr. LaBelle served in two Catholic parishes in San José, California, St. Joseph Cathedral and Most Holy Trinity, where he was involved in extensive pastoral work among immigrants from Latin America, Vietnam, and the Philippines. In collaboration with Frs. Gerald O’Collins, SJ and Daniel Kendall, SJ, he has co-edited Pope John Paul II: A Reader (Paulist, 2007) as well as Seek God Everywhere: Reflections on the Spiritual Exercises of St. Ignatius (Doubleday, 2010). He co-authored Being Catholic in a Changing World (Paulist, 2009) and Catholic Colleges in the 21st Century: A Road Map for Campus Ministry (Paulist, 2011) also with Daniel Kendall, SJ. Fr. LaBelle has directed recovery retreats at the Jesuit Retreat Center in Los Altos, California, and Bellarmine Jesuit Retreat House in Barrington, Illinois, as well as eight-day silent retreats at both Los Altos and Oshkosh.